Discover Cambados and live a romantic getaway in our house. 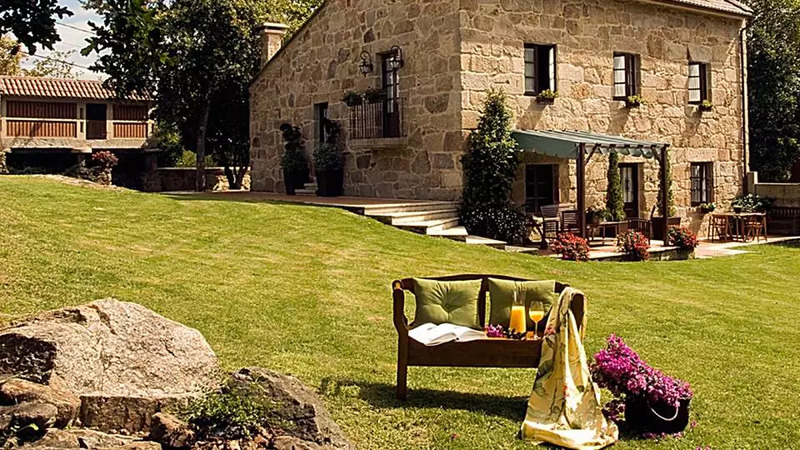 Casa Muñeira offers a wide selection of packages and special offers so that you can enjoy our house and the Rias Baixas during your holiday or Galician getaway. Stay in a small, rural, 19th century house (1800) located in the heart of the Salnes valley in Pontevedra, Galicia. This extensive native estate is surrounded by a magnificent natural setting , a forest and has a river that crosses through. The house is found in an evergreen valley, protected by a kind of microclimate, isolated, yet near the coast and historical city centres where one can enjoy rest, tranquility and a different kind of lifestyle. At Casa Muñeira there are 5 rooms, all with en suite bathrooms, completely exterior and with direct ventilation. They have been decorated with great care, heartfelt enthusiasm and attention to detail during its refurbishment. One of the rooms has a handicap access while the other is considered special because its bathroom has a hydro-massage shower cabin and sauna. On our estate there are several incredible and unique places where you can have a picnic, enjoy engaging conversation or simply play a boardgame. The tranquility of this setting fosters voracious reading while listening to the murmur of water flowing beside you and birds conversing. There is a wooden bridge that allows our guests to cross over the river that runs through our estate and enjoy a typical and exclusive picnic area in a galician forest. You can also find a grill where you can feast on a delicious barbecue. All of our rooms have good quality mattresses and pillows to ensure a good rest, along with reading pillows and flat- screen televisions. There are also remote control heaters in each bathroom. Daily cleaning is provided. If you need a reading lamp, a hairdryer, a styling iron or anything else, it will be provided for you right away with no obligation. Extra beds are also available (please inquire) as well as free cribs for children under 2 years old. We will also provide room service for breakfast (upon request) as well as laundry service. ¨A perfect vacation in a perfect setting¨ Everything here is a 10, the house is charming; we were treated wonderfully by Maite, by Carmelo when we arrived , and by Cruz, the girl that served our breakfast. Everything was delicious and they advised us on what to see, where to eat, and anything you asked them, they were like an open book. Thank you very much and continue as you are. Cheers from Paco and Encarna from Mallorca. ¨The house to relax in¨...This is a place for people who need to completely disconnect from their problems and have a relaxing holiday. The atmosphere is very homley. Breakfast is delicious. The owner gave us advice on where we could go for dinner, what we could visit and she was very helpful. She is also a very kind woman and we felt at home. ¨MY SECOND HOME IN GALICIA¨ I would like to warn that in this opinion I have placed feeling before reason. I was lucky enough to choose Casa Muñeira for our holiday in Galicia 7 years ago. It was love at first sight. We fell in love with Galicia, Cambados, Da Muñeira, and Maite and Gina. Also, because of those wonderful breakfasts we still remain friends with people from different parts of Spain. I´ll try to be brief because I could right a book, but just to say that we have a love in Galicia and this is Casa da Muñeira. From our third stay I would like to highlight that the kind, cheerful, and helpful Gina is enjoying her much deserved retirement. The new girl (I apologize because I am terrible with names) is the perfect substitute for our Gina. ¨11 points¨...We know where our next stop in Galicia will be. We are a young couple and we only stayed for a day but it was incredible. The tranquility of the setting was like a fantasy, it only has 5 rooms. And how the people who run the house treated us ..more than kind. Our rating is not nearly enough. Thank you. We will definitely recommend you.